Once you start this multi-level adventure, you might just find yourself pushing on, no matter the difficulty, to taste the sweet victory. 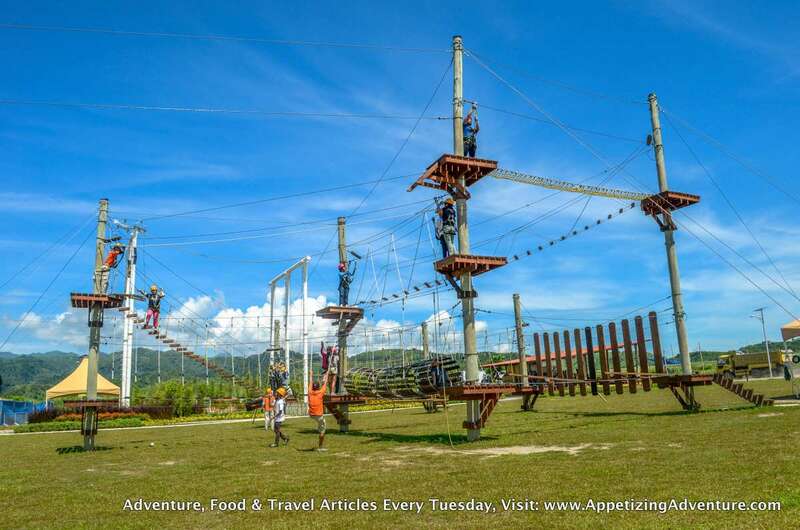 The Aerial Walk is an elevated obstacle course with high ropes, ziplines, and bridges to challenge you, to excite you, and to give you the adrenaline rush. To begin, you have to wear your helmet and harness. The facilitators will explain how to use the two special hooks attached to the guest. There are two starting points to choose from and you can always ask tips from the facilitators. You can either start with the Bouldering Traverse or the Seesaw. The Bouldering Traverse is like wall climbing, only sideways. The Seesaw is a bridge with seesaws you have to cross. Depending on which you choose, you might skip some obstacles. If you want to experience all the obstacles, just ask the facilitator how. 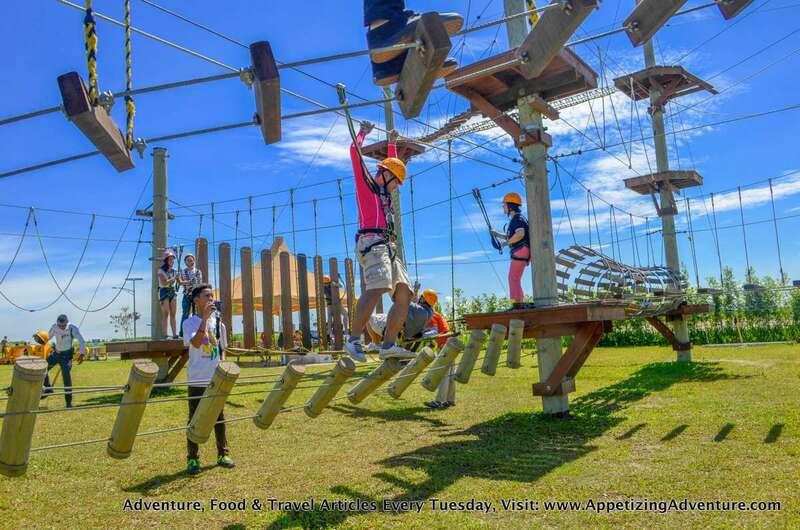 There are several obstacles on the first level, kind of like the “first floor” of the Aerial Walk, where the elevation is negligible. Diagon-Alley. This is a series of diagonal swings. You have to hold tight and maintain balance because your every step could swing you back and forth. Barreling. You have to crawl into the suspended barrels to get to the other side. Jacob’s Ladder. This is a suspended bridge much like a horizontal ladder. Multi-Vine Traverse. 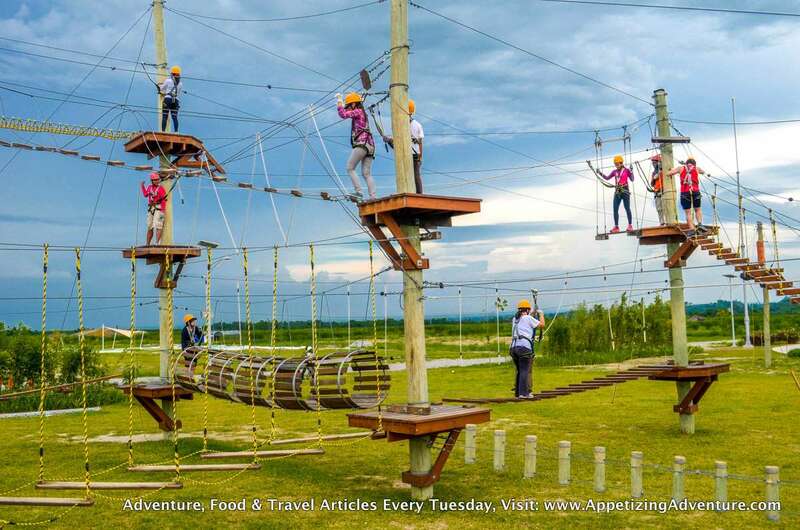 The guest will have to walk on a single cable and hold on to the “vines” or hanging ropes for balance. Stump. Cylinder shaped steps, or stumps, are attached to cables forming a bridge. It gets tricky because the stumps are wobbly. Rope Curtain. 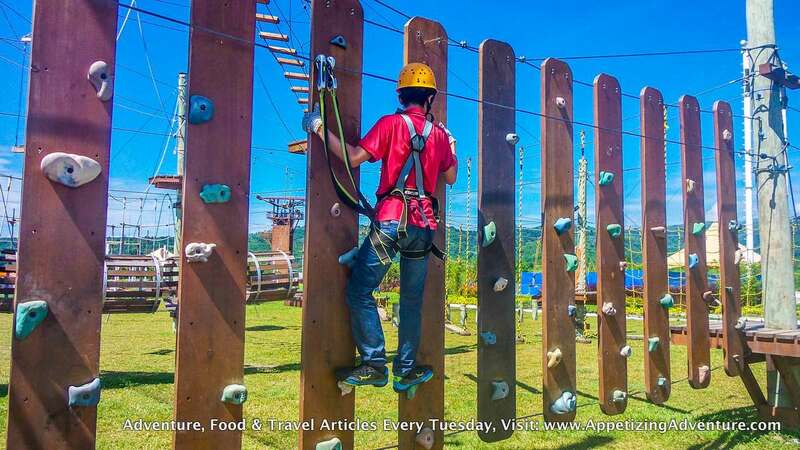 This requires you to walk on a single cable and you can hold on to the rope curtains for balance. Going up to the “second floor” of the Aerial Walk means going up the Diagonal Ladder. This may look scary, especially for those with fear of heights, but it’s fairly easy because this bridge is very stable. Now, in case you slip and fall, it’s okay. Your harness will keep you safely attached to the cable on top of you. You can step right back to the bridge, or cable, or whatever it was you were on before you slipped. The facilitators can also assist. V. This is like the Rope Curtain and the Multi-Vine Traverse, but the ropes to hold on to are attached to the top and bottom cables forming the letter V.
Trolley. You’ll have to step on this wobbly hanging trolley. The facilitator can pull while you’re on it to bring you to the next obstacle. To go to the “third floor” of the Aerial Walk, cross the Broken Bridge. It’s like Jacob’s Ladder. Net Bridge. This is the tallest bridge of the Aerial Walk and the only bridge at the “third floor.” For those with fear of heights, this may be challenging. There aren’t any ropes to hold on to for balance, except for the harness straps connecting you to the cable above you. 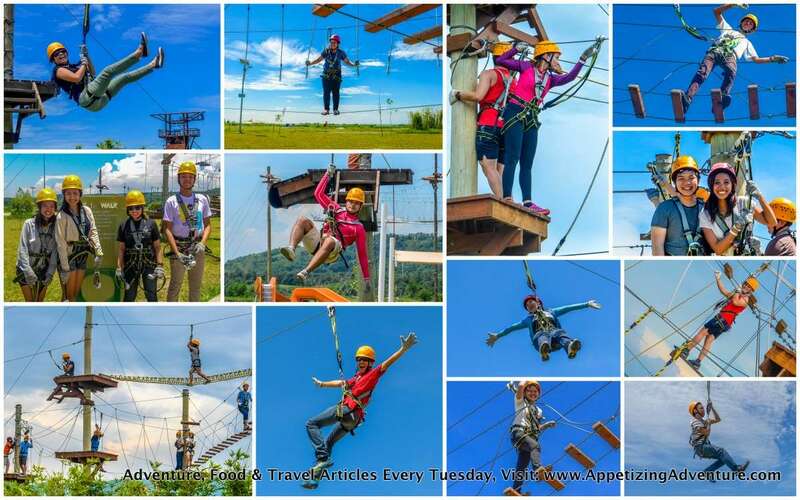 Ziplines. 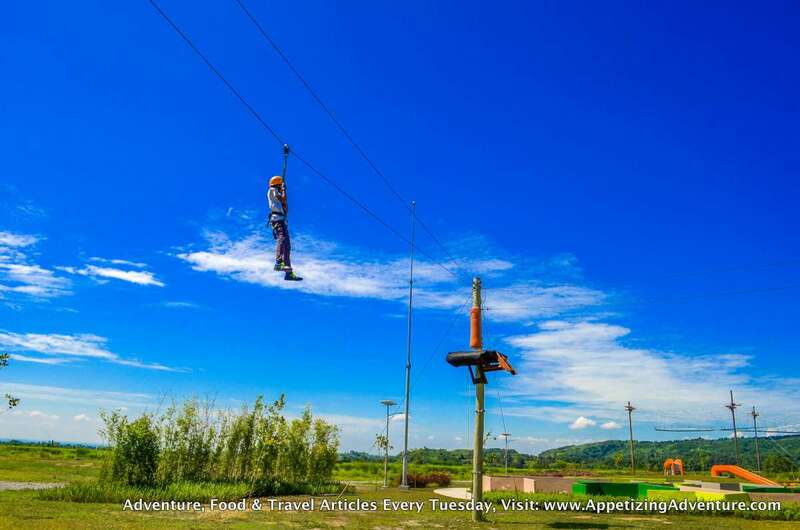 There are three ziplines. 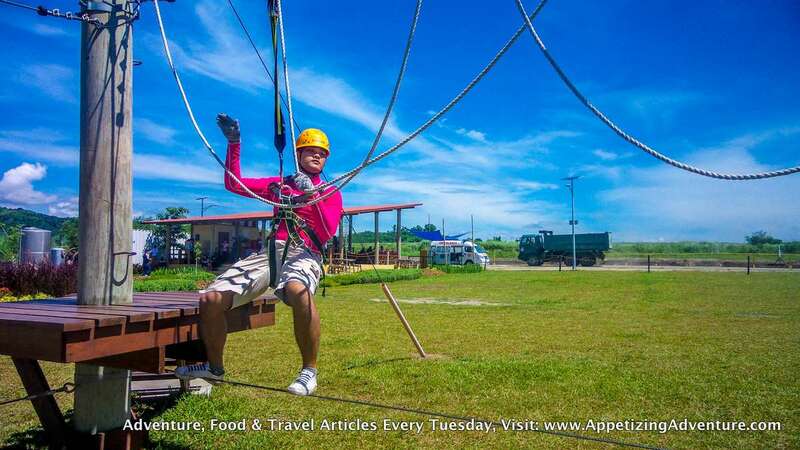 It’s not like the regular zipline where facilitators help launch you and another facilitator would be waiting at the landing platform. This time, you do it yourself. 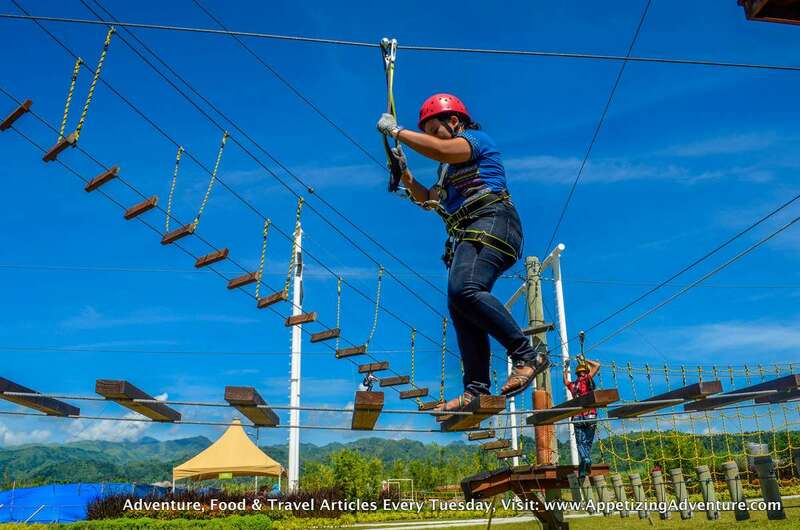 From the “third floor,” the first zipline is probably the most difficult to do. The trick here is to stop thinking and just step off the platform. The more you think, the longer it will take for you to make that move, most of the time. Another challenge here is the landing. Some of our friends after reaching the next platform bounce off a few feet away, still suspended. 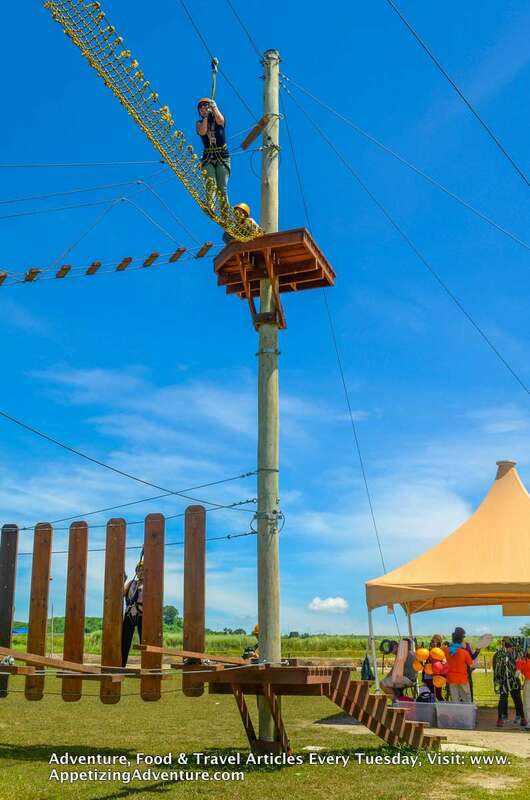 So without the needed momentum, the facilitators pull them until they are standing steadily on the landing platform. 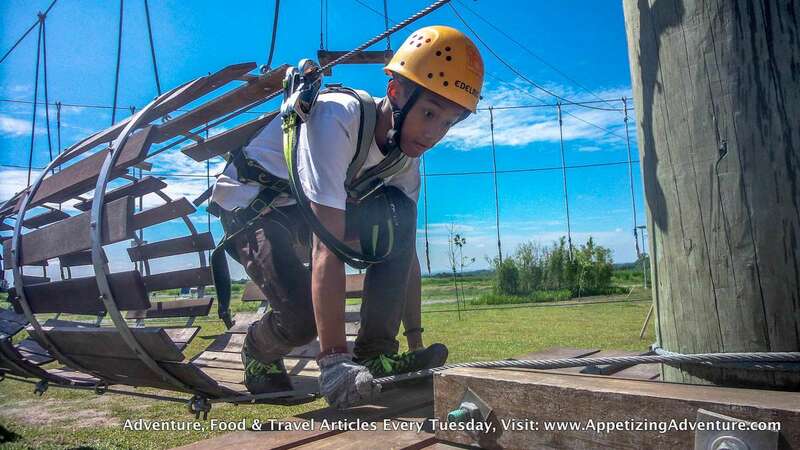 The shoe of one of our friends fell while doing the zipline. So make sure your footwear isn’t loose and tied tightly. 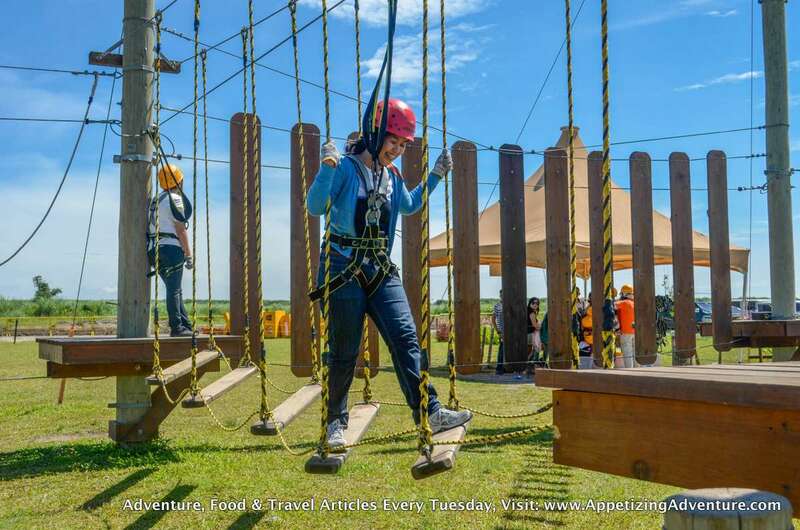 After the third zipline, you’ll be back on the “first floor” for the final obstacle which is the Cargo Net Traverse. And after this, you’ve successfully completed the Aerial Walk. 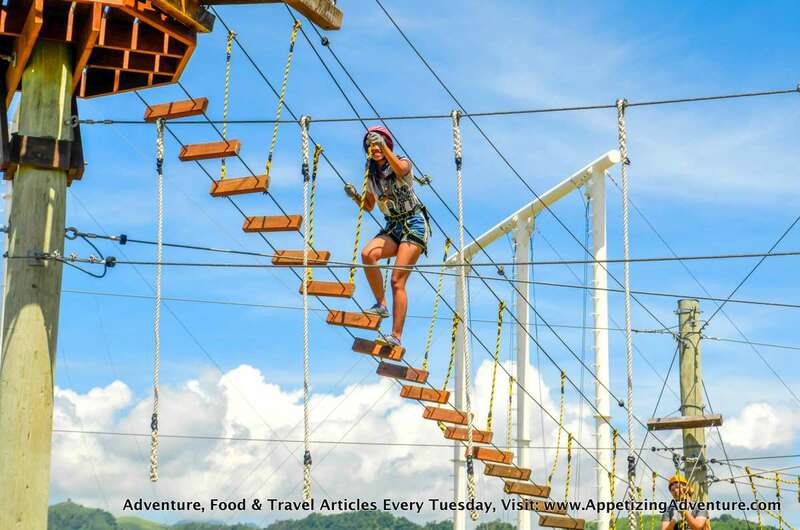 Kerry said that the normal time it would take for a guest to complete the Aerial Walk is 30 minutes to one hour. This can also take longer depending on the traffic, or the number of guests simultaneously engaged in the activity. They recommend that at any given time, only one person per obstacle be allowed. Those I spoke with who finished this obstacle course felt a great amount of fulfillment after. They were champions. It’s about conquering fears, putting the muscles at work, pushing forward despite the desire to go down and quit. So when you’ve completed the Aerial Walk, give yourself a pat on the back.